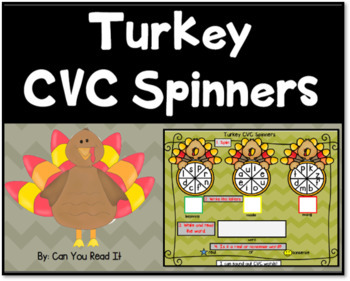 Use this fun Thanksgiving game to help your students decode real and nonsense CVC words, The cute turkey spinners make it engaging. 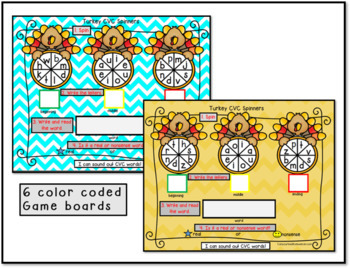 There are 6 different colored game boards to use for increased practice. There is a take home game included to extend the practice at home. 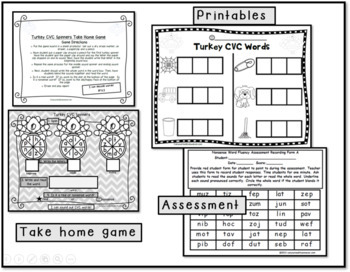 Also included are printables that can be used as exit slips at the center or follow up seatwork or assessments. There is a nonsense word fluency assessment tool included too. 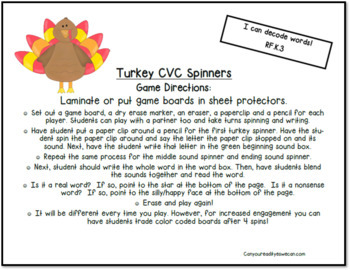 Perfect for literacy center, intervention or Daily 5. Fun for a Thanksgiving party too.